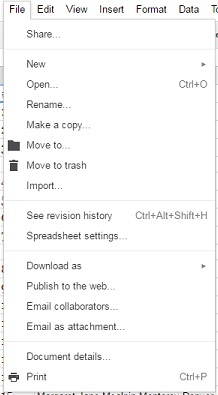 Do you have a document in Google Drive (such as a spreadsheet) you would like to embed into your blog or website? 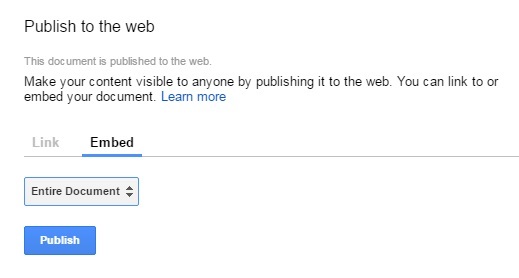 By doing so, whenever you updated the document in Google Drive, it would automatically update on your blog/website. Select "Publish to the web..."
If it's a spreadsheet, you'll have the option of choosing between "Entire Document" or an individual "Sheet." I have transferred the ahnentafel I created back in 2010 to a spreadsheet and created a new page accessible at the top of the blog. I have also created a page for Notable Kin which currently consists of the table I began a week ago containing the alleged celebrities Ancestry's new mobile app has suggested.